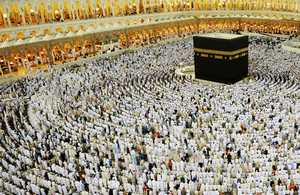 PHE and NaTHNaC outlines health and travel advice for Hajj and Umrah pilgrims. Public Health England (PHE) and the National Travel Health Network and Centre (NaTHNaC) strongly urge everyone travelling for Hajj and Umrah to familiarise themselves with all the latest health and travel advice and information for these pilgrimages, which is available on the NaTHNaCwebsite. With growing evidence indicating the role of camels in transmittingMERS-CoV to humans, we’re advising all travellers to the Middle East, particularly those with underlying or chronic medical conditions, to avoid contact with camels and camel products, and to practise good hand and respiratory hygiene to reduce the risk of respiratory illnesses. Pilgrims returning from Hajj and Umrah with flu-like symptoms including fever and cough, or shortness of breath within 14 days of being in the Middle East, should contact their GP without delay and inform them of their travel. Our updated health information sheet for pilgrims includes information on health regulations, vaccine requirements, recommendations and general health advice for those planning to travel for the Hajj and Umrah. Pilgrims are strongly advised to follow our specific guidance about staying safe and healthy when travelling. The Hajj is the largest annual international gathering, with more than two million Muslims travelling from around the world, including thousands from the UK. A large population in one confined area has historically increased the risk of infectious disease outbreaks, which is why it is important to get the relevant vaccinations and to get travel advice from your GP or travel health clinic. Hajj, the annual pilgrimage to Makkah (Mecca) in the Kingdom of Saudi Arabia, is estimated to fall during early October 2014. Umrah is a shorter, non-compulsory pilgrimage for Muslims that can be performed at any time. For the latest travel advice, see the NaTHNaC website. General travel health advice for travellers to Saudi Arabia is available fromNaTHNaC. MERS-CoV is a new type of coronavirus first identified in a Middle Eastern citizen in 2012. Although cases continue to be reported from the Middle East, no new cases of MERS have been detected in the UK since the cases linked to the Middle East in February 2013. See PHE’s webpages on MERS-CoV. The National Travel Health Network and Centre (NaTHNaC) promotes standards in travel medicine, providing travel health information for health professionals and the public. NaTHNaC is commissioned by PHE. PHE exists to protect and improve the nation’s health and wellbeing and reduce health inequalities. It does this through advocacy, partnerships, world-class science, knowledge and intelligence, and the delivery of specialist public health services. PHE is an operationally autonomous executive agency of the Department of Health.